I'll try to take some pics of mine tonight as well, the only reason I had that pic is beacuase I botched mine first time round and Clayton had to help me out. 8/27/2012- Figured out what was wrong with my throttle cable setup. There was minimal/no lubrication in the tubing, so I added some 3-in-1 oil. Worked great. Also figured out how to rig up a spring to the throttle lever on the engine, so it returns back to slow after revving it up. I'll add some pics soon. Here are the pics I took. I had some excess hardware from another project, plus used a couple pieces from the rototiller to get the throttle to adjust right. How does she ride now? The bike is turning out great :thumbsup:....it reminds me of being a kid and some of the homemade bikes and karts my Dad and Uncle used to build way back when..
@ Tanksareus- Thank you! It rides great! It's really nice to be able to just "go" without having to take your hand off the handlebars to adjust the throttle! @ 125ccCrazy- Thank you! I've had the frame since I was about 8 or 9 years old, and I finally decided to make this happen. Glad I did too! Thankfully, he just coasted across the front yard. I saw some of the deals on OMB Warehouse's site and will probably get something from them, brake-wise, in a few weeks. Here's a Link to a test run after I got the twist grip throttle working! Enjoy! It was originally 1 min, 55 seconds long, but Flickr cuts it off at 1 min, 30 seconds. I managed to mount a camera on the front using a few bolts and a Dasco nail puller/pry bar. It had two holes, so I put a 1/4"-20 bolt in the front for the camera, and a 10-24 nut/bolt with washers through a hole in the frame to mount it. Worked pretty good! The whining/buzzing noise is the scrub brake rubbing on the tire. A few times, you'll hear the engine sputter before acceleration, and that's where I would pull on a blue wire I attached to the governor control on the carb. It needs adjustment, but when I pull it when accelerating, it'll get me up to speed faster. There's got to be a better way than just "pulling the blue wire." I rode the brake because it doesn't stop well unless I lean to the right a bit so I can get a little extra leverage and push the brake pedal down a bit further, otherwise there isn't enough of the scrub rubbing on the tire to get it to stop quick enough. I'm noticing the biggest difference for me is tire size. I grew up riding bicycles around the yard and through the woods, and taller tires seemed to give me additional clearance when going around corners (because the foot pegs/brake pedal are welded on and make it a bit more difficult to stop when turning to the left). oh yeah I hear that. You will get it sorted out, but it runs good and is drivable. Plenty of bigger tires out there in the future. You have a good place to ride it looks like which is cool too. Been thinking about this build. Have any progress to share? Hey, I know it's been a very long time (a couple years at least) since my last post here. I still have my square tube framed minibike, but it has unfortunately spent a good long while living in the shed, with the occasional ride around the yard to keep it running. It's been a busy/hectic past couple of years, and since I am no longer working 2 jobs, I hope to get back to working on this, or at least have some fun tinkering with it. In the spare time I had, I gained some experience tinkering with old lawn mower engines, weedwackers, a power washer or two, just to keep up some skill. I don't have any pics to add at the moment, but I did manage to locate a 3 quart Briggs fuel tank in the beginning of the spring at the local scrapyard. 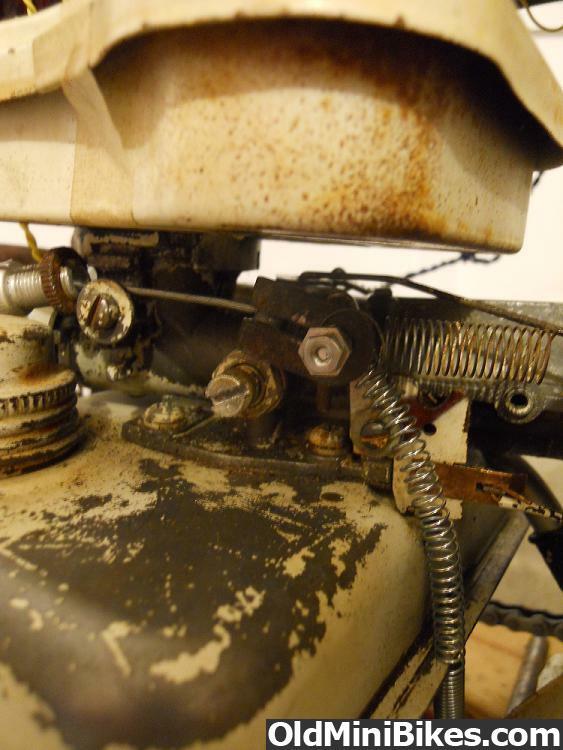 I am considering replacing the current pulsa-jet carburetor/1 quart fuel tank on the 3.5hp Briggs engine on my minibike, and swap it for the to the pulsa-jet carburetor/3 quart tank from the scrapyard. It came off a 5hp Briggs L-head, that I believe was connected to a larger rototiller. If it works, it'd be nice to be able to ride for a bit more extended period of time without needing to refill the fuel tank. First things first, I need to clean the carburetor, and find out what adjustments I need to make to get it to run smoothly. I previously had modified with throttle linkage, (which was set to run at a set speed on a '78 Hechinger Rototiller), but the spring which runs from the throttle to governor somehow got loose, and when I reattached it (to where I thought it should be to the best of my memory), there is either too much play, and it won't rev up, or too much tension and it wants to start to rev up on it's own, which is disconcerting. 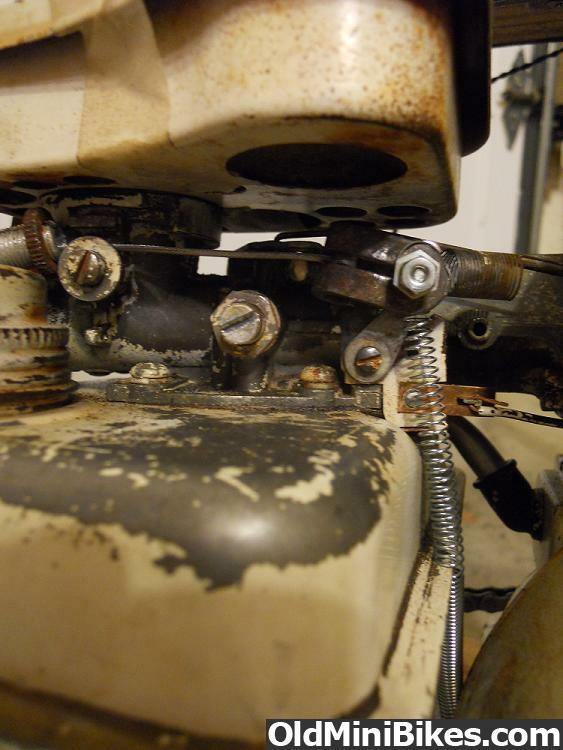 The throttle linkage from the carb/fuel tank that came from the 5hp in the scrapyard, has a slightly different setup. I am hoping to maybe use some of those parts to make the throttle work smoother. Lastly, I would like to get a new rear sprocket, as the current one is warn. I am considering ordering a new one, but the bolt hole pattern is only 5 holes, rather than the more common 6 hole sprockets. I think I have pics from my pics page on here that show what I am talking about. 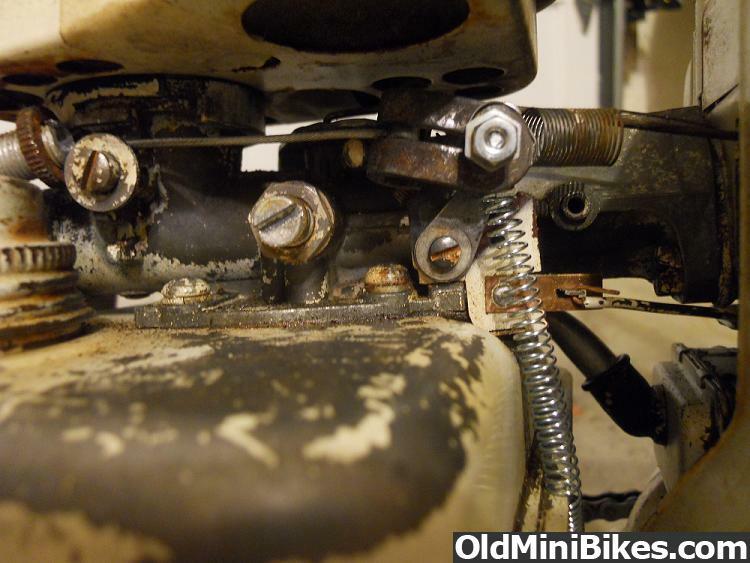 Here's to hoping to get my Square Tubed Minibike project back underway! *holds a cold Pepsi in the air* Cheers! I will try to get some new pics posted asap. I know this is a really old thread. Found this picture today. Unless Nebraska's bike was or is now pink, I don't think it's the only one out there.